I didn’t own a television when 9/11 happened. Sure, I caught glimpses of the falling Towers on televisions broadcasting at my workplace or in the homes of friends and family. I even remember pouring through the images of 9/11 on the internet, and inhaling every photograph I could get my hands on in newspapers and in print. Still, my strongest recollections of 9/11 are not visual, as compared to many in our country who watched the images over and over again in horror on 24-hour television news cycles. My memories of 9/11 are shaped instead from listening to countless hours of radio in the months following the tragedy. What strikes me about my experience is that I can’t really remember the voices or the stories that played in the backdrop. However, I do vividly remember the music that NPR played continuously in a loop, in between news segments. I even remember that NPR chose to play this music in long stretches of time rather than repeatedly airing news features. 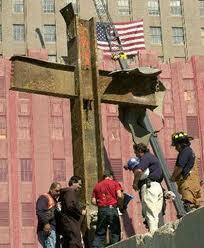 Looking back, I’m sure it’s because words were just inadequate in capturing the grief of our nation at that time. It is this music that will forever be emblazoned upon my heart, my mind and my memories of 9/11. In fact, every year on the 9/11 anniversary, I go back and revisit this music. I revisit this music to reflect. To reflect on my loss. The loss of my countrymen. The loss of my wide-eyed idealism. To reflect on my God. My God who gives me life, hope and a future. My God who gave refuge to my then-fiancé/now-husband, as he was headed to the World Financial Center that morning for work. To reflect on who I am. As a child of God. As a wife, mother and woman—a woman with many personal and professional gifts, interests and ambitions. In these moments when I revisit this music and commune with God’s spirit, I realize that there can be no true authenticity in my life without constant reflection. You cannot be real and transparent unless you look deeply in the mirrors of your God-given soul to see where you have been and where you are headed. You cannot even begin to know yourself or your God, or be able to identify those around you who are in need, unless you take time to reflect. Take time today to reflect on the state of your inward self, your inner man. Is it where you want her to be? Most importantly, is it where God wants her to be?